Highlighting Thailand and Cambodia’s rich histories, fascinating cultures, and religious monuments, this Thailand and Cambodia tour includes overnights in Siem Reap, Bangkok, Kanchanaburi, Ayutthaya, Phitsanulok, Chiang Rai, Chiang Mai, and Phuket. Your budget-minded tour of Cambodia starts in Siem Reap to visit the magnificently preserved temples of Angkor Wat, Angkor Thom and Bayon Temple-with some 200 faces carved into 54 towers. You’ll also visit the exquisite 10th-century Banteay Srei and Ta Prohm, where ancient jungle tree roots wind through the temple ruins. 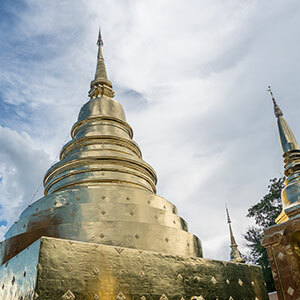 Your tour through Thailand includes visits to some of the cities that have served as the country’s capital: Bangkok, Ayutthaya, and Sukhothai. In Bangkok-Thailand’s current capital-visit the Temple of the Golden Buddha; the Temple of the Reclining Buddha built in 1832; and the Grand Palace, the royal residence begun in 1782 where you’ll see the Emerald Buddha, Thailand’s most sacred Buddhist sculpture. In Ayutthaya, Thailand’s ancient capital, your sightseeing includes a visit to Bang Pa-In Palace, which was built as a summer residence for the Kings of Ayutthaya. In Sukhothai, Thailand’s 13th-century capital, visit Sukhothai Historic Park, a UNESCO World Heritage Site with ruins of palaces, temples, and homes. On this Thailand tour, you’ll also have an opportunity to learn about the Thai culture. In Bangkok, enjoy a Thai dinner accompanied by Thai classical music and dancers. Visit the legendary Damnoen Saduak floating market and see traders sell exotic fruits, vegetables, and more from their boats. And in Chiang Mai, enjoy a visit to San Kampaeng to see local craftsmen make Thailand’s traditional lacquerware and antique wood furniture.